OPERATING-SYSTEM - What is CTSS? OPERATING-SYSTEM - What is MULTICS? OPERATING-SYSTEM - What is IBM OS/360? OPERATING-SYSTEM - What is Election Algorithms ? OPERATING-SYSTEM - Explain Reaching Agreement. OPERATING-SYSTEM - What is Atomicity? OPERATING-SYSTEM - What is Concurrency Control? OPERATING-SYSTEM - What is VxWorks 5.x? We first discussed disk scheduling in Chapter 12. There, we focused primarily on systems that handle conventional data; for these systems, the scheduling goals are fairness and throughput. As a result, most traditional disk schedulers employ some form of the SCAN (Section 12.4.3) or C-SCAN (Section 12.4.4) algorithm. Continuous-media files, however, have two constraints that conventional data files generally do not have: timing deadlines and rate requirements. These two constraints must be satisfied to preserve QoS guarantees, and diskscheduling algorithms must be optimized for the constraints. Unfortunately, these two constraints are often in conflict. Continuous-media files typically require very high disk-bandwidth rates to satisfy their data-rate requirements. Because disks have relatively low transfer rates and relatively high latency rates, disk schedulers must reduce the latency times to ensure high bandwidth. However, reducing latency times may result in a scheduling policy that does not prioritize according to deadlines. 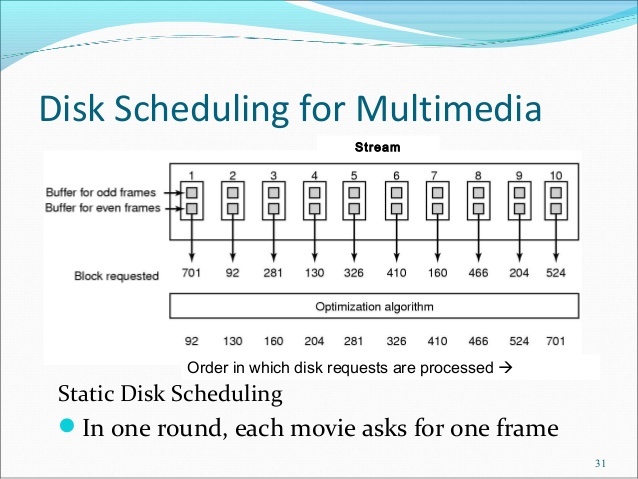 In this section, we explore two diskscheduling algorithms that meet the QoS requirements for continuous-media systems. We first saw the earliest-deadline-first (EDF) algorithm in Section 19.5.2 as an example of a CPU-scheduling algorithm that assigns priorities according to deadlines. EDF can also be used as a disk-scheduling algorithm; in this context, EDF uses a queue to order requests according to the time each request must be completed (its deadline). EDF is similar to shortest-seek-time-first (SSTF), which was discussed in 12.4.2, except that instead of servicing the request closest to the current cylinder, we service requests according to deadline—the request with the closest deadline is serviced first. The fundamental problem with strict EDF scheduling is that it ignores the position of the read-write heads of the disk; it is possible that the movement of the heads will swing wildly to and fro across the disk, leading to unacceptable seek times that negatively affect disk throughput. Recall that this is the same issue faced with FCFS scheduling (Section 12.4.1). We ultimately addressed this issue by adopting SCAN scheduling, wherein the disk arm moves in one direction across the disk, servicing requests according to their proximity to the current cylinder. Once the disk arm reaches the end of the disk, it begins moving in the reverse direction. This strategy optimizes seek times. SCAN-EDF is a hybrid algorithm that combines EDF with SCAN scheduling. SCAN-EDF starts with EDF ordering but services requests with the same deadline using SCAN order. What if several requests have different deadlines that are relatively close together? In this case, SCAN-EDF may batch requests, using SCAN ordering to service requests in the same batch. Suppose we are at ti meo, the cylinder currently being serviced is 50, and the disk head is moving toward cylinder 51. According to our batching scheme, requests D and F will be in the first batch; A, G, and H in batch 2; B, E, and J in batch 3; and C and I in the last batch. Requests within each batch will be ordered according to SCAN order. Thus, in batch 1, we will first service request F and then request D. Note that we are moving downward in cylinder numbers, from 85 to 31. In batch 2, we first service request A; then the heads begin moving upward in cylinders, servicing requests H and then G. Batch 3 is serviced in the order E, B, J. Requests I and C are serviced in the final batch.